Now here’s a contrast, a unibody aluminum MacBook with a blast from the past… a PowerBook Duo 270c! 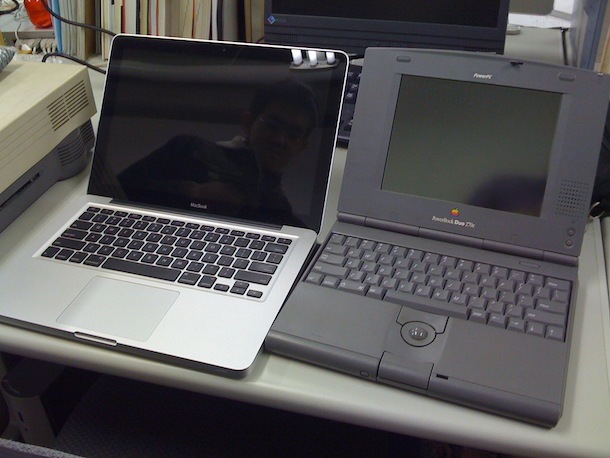 The PowerBook Duo series was just about the most stylish and snazzy laptop you could get in the early to mid 1990’s, but over a decade later it just can’t compete with a unibody MacBook. I dunno that thing still looks pretty snazzy to me. It had an awesome dock too! amazingly enough that Duo still looks better than most PC’s, if you extended the screen to the edge more and replaced the trackball with a trackpad, darkened the plastic, it’d look better than any Dell or Lenovo I’ve seen.